You need to plant your Garlic bulbs in an open, sunny site with well-dug, fertile soil so that your bulbs get the warmth they need to ripen. 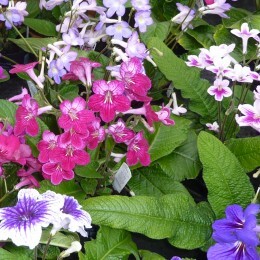 Recently manured soil is not recommended as it may cause the bulbs to rot. 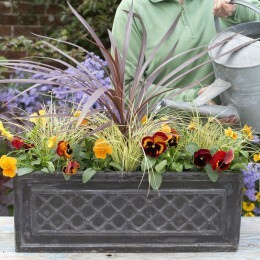 You can buy spring and autumn bulbs for planting. 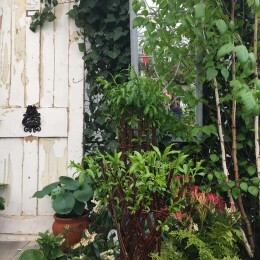 The obvious is your gardening gloves….a rake…..a trowel and, of course, your garlic bulbs. You can also use a cane or gardening string to guide them into place. 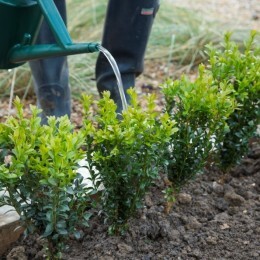 Make sure the ground is free of weeds by weeding with a hand trowel and has been raked to a level surface. Gently break the bulb of garlic open and detach the cloves off the bulbs, you don’t need to peel the paper skins off the cloves. 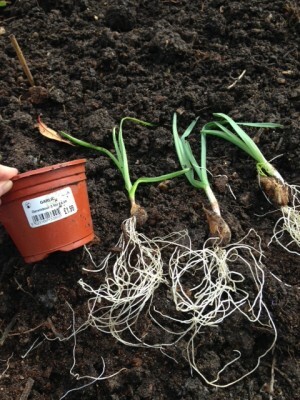 Here at Perrywood Garden Centre, you can buy our own garlic bulbs that we have already started in a pot. 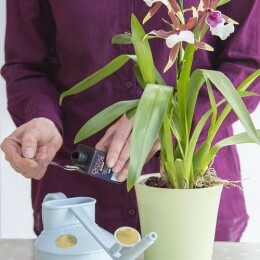 All you need to do, is take them out of the pot and detach each clove ready to plant. 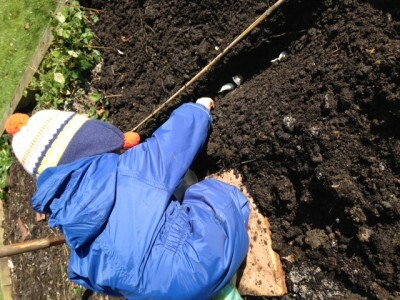 Push the garlic cloves into the soil to a depth of 3cm/1” deep and 10cm/4” apart along the row. Remember, the flat basal plate (bit at the bottom of the garlic), should be facing downwards with the pointed end facing the sky. Each row should be 30cm apart. 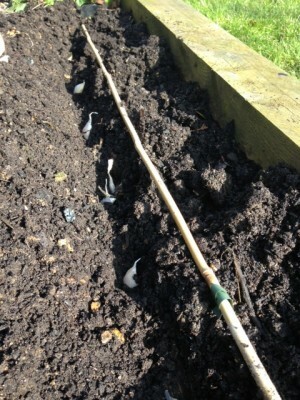 As the garlic begins to grow, continue to weed carefully around the plants. TOP TIP: Check your crop after planting for any uprooted bulbs caused by animals and birds, and push them back into the soil. The garlic is ready to harvest when the leaves begin to turn yellow and die, usually from June and July onwards. Lift the garlic carefully using a fork to gently loosen the soil around the bulbs. Spread the bulbs on netting, wire mesh, sacking or trays to dry out properly. 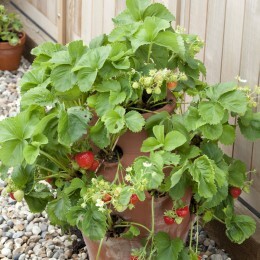 After they’re dry they can be plaited using the dried leaves, hung in bunches or stored in net bags. The origin of garlic is unknown, but it has been used as a plant for medicine and as food for more than 4,000 years. In the Middle Ages it was thought that garlic helped to prevent the plague. 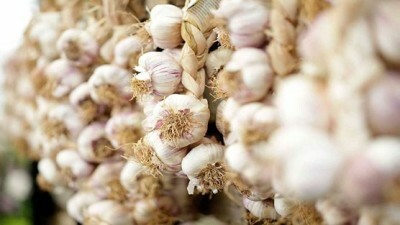 The English word garlic originates from the Middle Ages, gar (spear), leac (pot herb). We love garlic in almost everything but how can we get our children to love it too? We’ve found the perfect easy recipe to cook with your children…who will love eating it too…! TOP TIP: You don’t have to use fancy bread, you can just use an ordinary loaf – whatever you have to hand.